This is the tenth in the series of instructions on how to build the YSM35B Vibrating 35mm DOF Adapter. In the last part we attached the motor to the adapter. Now we finalize the vibrating adapter. Remove ring #3 and adjust the focus screen distance. Do the same adjustment for infinity focus as you did earlier in the series. Once you have the distance right, glue the top focus screen mount to the stilts. Tap the glue gun to the edge of the stilts and let it drip down to the mount. Pull the glue gun away carefully to not drop any on the focus screen. Do all three stilts. Then glue the motor as well. Allow to cool. Then close everything up! The above video has an extra section explaining one battery versus two. Above is a demo using the 1 battery setup. You can see some oscillation in the image. Unlike the YSM35A this model is running too slow. I've changed back to the original 2 battery design. I hope you had fun during this build. Watch for future updates. Now go out there and make movies. Good luck! This is the ninth in the series of instructions on how to build the YSM35B Vibrating 35mm DOF Adapter. In the last part we reviewed the differences between the YSM35A and YSM35B. Now we attach the motor and power connector to the adapter itself. Wear safety glasses when operating the drill. Disassemble the static adapter from Ring #3 out. Leave Ring #2 attached to the F-mount. The motor mount area should be bottom. Note the alignment of the focus screen mount so the motor will become a fourth leg. Take ring #2 on the adapter and mark out where you need to put the phono plug. It should be on the bottom and between the front and rear threads. Examine the ring inside and out before you drill. Make a pilot hole with a 1/8" drill bit to start. This will take a few minutes of drilling. Rest your drill every so often. Then check to make sure your distances are alright. You shouldn't eat into the rear thread where ring #3 attaches or the front thread where the Nikon F-mount attaches. Enlarge the hole with a 1/4" drill bit. This will be much quicker. Clean your work area of the aluminum dust. Heat up your solder gun now. Meanwhile find your other phono plug. Remove the washer and middle/center conductor. Leave the spacer. Slot that onto the hole you made into ring #2. 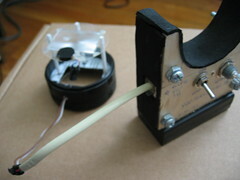 Attach the conductor to the threads on the phono plug from inside ring #2. Follow with the washer to fasten both together. The connector tab for the conductor should be facing inward. Tin the back/center pole and the middle/outer conductor. Solder the red wire from the vibrating motor to the back/center pole. The blue wire goes to the middle/outer conductor. This should result in center of phono plug being positive and outer being negative. This matches the control box. You can now re-assemble the vibrating mount, ring #2 and nikon F-mount together. To get the vibrating mount in you may have to insert it at a slant. Screw it all together via the found mount rather than rotating ring #2. Re-align the right side stilt(leg) to the F-mount locking pin. Then remove the adhesive backing from the motor and press it on to the top focus screen mount. During this endeavor the focus screen mount was probably displaced. Adjust the distance of the focus screen. Later we will glue the stilts so the distance is permanent. For now, just get it in the approximate distance. You might have to bend or loop the solid core wire so it doesn't bend the other legs. The adapter now has four legs. Clean the focus screen. Hopefully you didn't touch it at all during this process. 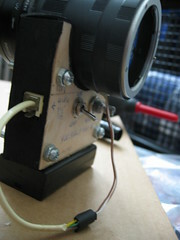 Attach the control box and test. We finalize the vibrating adapter. We need to readjust for correct infinity focus. Once we are confident, we glue it to be permanent. This is the eight in the series of instructions on how to build the YSM35B Vibrating 35mm DOF Adapter. In the last part made the control box. Now we re-examine the difference between this version and the original. The original YSM35A used a Rheostat and Power switch. I couldn't find a Rheostat this time around so I subsituted with a Mini Volume Control. Rheostats and Volume Controls are found in the Potentiometer area of hobby electronics (e.g. Radioshack). The difference is Rheostats are made for higher voltages and doesn't turn off. That is why the power switch (SPDT Mini-Toggle) is needed. A volume control switch is a potentiometer with a built-in SPDT switch. We will be using a tiny motor so it should be fine to put 1.2 to 3 volts through it without burning it out. The dial won't have the precision of a rheostat but it will do. Another difference with the A model is the use of only one battery. This reduction from 2.4 - 3v (NIMH/Alkaline) to 1.2 to 1.5 volts (NIMH/Alkaline) is an experiment. With the soldering skill you develop it won't be too hard to change battery holders later. We attach the motor and install a power plug on the adapter itself. This is the seventh in the series of instructions on how to build the YSM35B Vibrating 35mm DOF Adapter. In the last part we extended the wiring for the pancake motor. We now assemble a control box. This part is temporary to see if the switches and wires are good. It also has a short note on filling the connector holes with solder. If you're feeling confident you can skip this part. Take the Mini Volume Control switch and look at the connector poles. There should be a marking 1,2,3 or just 3 on it. Solder the red wire of your battery holder to the outer pole #3. Take a splice of wire (red) and solder that to the back pole of the phono plug. Remember to wear safety glasses when operating the drill. Little burrs tend to fly! Take both and do a test fit in the project box. Mark the locations and start drilling. Both of the parts I used fit through a 1/4" hole. Drill a holes, using a smaller pilot first, at low speed then gradually speed up. Once you punch the holes in, pull the drill bit out partially and run it in reverse to clean it out. You can usually remove any burrs by hand. Once clean you can do another test fit. Rheostats and Volume Switches have a tab on one side to keep it from rotating. Tap another smaller hole for it with a 1/8" bit. If there are obstructions you can use a sanding bit or cutter to clean them out. Take your phono plug and solder a red wire to the pole on the back. This pole connect to the middle part of the phono connector. We will use this for the positive wire. Remove the washer, middle conductor and spacer from the phono plug. We are probably discarding the spacer. Slip the phono plug with its positive wire into the project box. Then slip the middle/outer conductor and washer on. The middle/outer conductor will be used for negative and transmits power though the outer metal of the phono plug. Tighten the washer. Tin the black wire on the battery holder as well as the middle/outer conductor. Solder the black wire together to the middle conductor. Now attach the volume control switch to the project box. Put the spacer on the front and tighten with the washer. With the connector poles pointing up make sure the red wire on pole #3 is out of the way. Tin the middle pole #2. Tin the red wire from the phono plug as well. Then hold the solder iron to the middle pole to keep it liquid. Poke the end of the phono's red wire through the pole. Remove the soldering iron. Inspect your connections to verify that red and black aren't wires aren't directly touching. This would cause a short. At this point you now have a working control box. You can plug a battery in and turn on the Volume Control switch to maximum (clockwise). Take the vibrating motor and touch the 'blue/black' wire to the outer metal part of the phono plug. Then touch the red wire to the middle metal part of the same plug. The motor should vibrate. Review the final control box and differences in design to the original. This is the sixth in the series of instructions on how to build the YSM35B Vibrating 35mm DOF Adapter. In the last part we adjusted the distance of the ground glass to achieve sharp infinity focus. A test of the static mode showed the grain and dust that could stick to the ground glass. We now begin to assemble the electronics. I have no training in electronics. But I asked some people who did and picked up how to use a soldering gun. If this is your first time you might want to practice on some scrap wire first. We want to extend the wiring of the pancake motor so I picked some solid core from a splice of CAT5E cable. You can use telephone wire but this tends to be thin. Solid core is rigid and easier to strip without destroying it. My technique is to use a nail clipper. Apply light pressure to pinch the insulation then twist the wire around. It doesn't have to go all the way through. Pull on the insulation and it is now stripped. Do not worry too much if you take out too much. Just make sure you have enough to contact with the wires on the pancake. Do this to the other end of the wire as well. Prepare two. The basic soldering iron is a device that will produce heat. It should be enough to melt the solder wire. At the right temperature the wire changes from a solid to a liquid. Once that heat is removed it cools quickly and turns back into a solid. To prepare the soldering iron make sure the tip is clean. I like to use sandpaper to scrape off excess carbon from previous uses. Plug in to the wall socket and allow to heat for a few minutes. Be careful not to touch anything but the handle. Once heated it is easiest to touch the solder to the tip and allow it to bead. Rest the solder gun on something solid and non-flammable. Two wires will stick easily if they are tinned. Tinning is applying a coat of solder on a wire. This way just touching the two wires together with the iron on one side would join them. You will need both hands to the final join. With the iron rest at an angle, touch both wires together onto the heated tip. When you see the solder bead or melt pull both wires away. The solder should quickly cool. When hot the solder looks silver. Cold its a dull grey. If you take too long you might melt some insulation. And you might notice heat along the wires. This is okay for the most part. Its possible to short the motor if the two exposed solder joins come into contact. To prevent this we could use various types of insulation from electrical tape, to heat shrink tubing and hot glue. In the YSM35A I found that electrical tape tends to lose adhesion over time. Heat shrink is hard to shrink significantly enough. So this time around I tried hot glue. It is non conductive and malleable. So I apply a coating of hot glue around the two solder joins. Then I glue both together. The two joins are separated by the layer of glue. Now its time to see if it works. Take a AA battery and touch the "red" wire to positive and "blue/black" wire to negative. The vibrating motor will work in either way but this is the convention. Next we'll create a control box with a battery holder, speed control, and power switch. This is the fifth in the series of instructions on how to build the YSM35B Vibrating 35mm DOF Adapter. In the last part we assembled the mount without the electronics. At its present state it is a static adapter. We will adjust the ground glass distance to have correct infinity focus. Watch the video. Pardon the bad audio, it was windy that day. First attach your choice of 35mm prime lens unto the F-mount. Set to infinity and set to the widest setting (lower number). Aim the assembly at some far away trees. Remove the #3 and #1 rings Push the top base closer or further away until the focus screen (ground glass) gives you the sharpest image you can perceive. It should be somewhere between 45mm-46.5mm. In my case it was a tad more than 45mm. Check that the top mount is as horizontal as possible. Screw back the #3 and #1 rings. Now attach your Macro, Circular Filter ring and Step up rings. Attach to the camcorder. Turn on the camcorder and look through the viewfinder. You should see the image on the ground glass. Rotate the assembly until the screen looks horizontal. You can "lock" the CPL with a rubber band. The friction keeps it from moving when you make manual adjustments to the lens later. Use the camcorder zoom to cover the entire recorded image. Note the LCD doesn't show the overscan area. Turning off Image Stabilization is probably a good idea as well. Point at some far away objects and let autofocus zero in on the focus screen. Lock manual focus. You now have the adapter adjusted. It can be used as a static adapter and you could stop right here. In lower light cases or stopped down you will notice static grain on your images. The rest of the series will go toward eliminating that. Download the video directly from the Vimeo page. Watch it full screen. Setting infinity focus will be important later when we make the focus screen vibrate. You will notice some lens dust and grain in the static test above (download and view full screen). A vibrating adapter will remove that. We start on the electronics that will vibrate the focus screen. This is the fourth in the series of instructions on how to build the YSM35B Vibrating 35mm DOF Adapter. In the last part we started to cut the base parts of the mount. Here we finish building the static part of the mount. Watch the video because its easier to explain that way. We start by drilling holes on the two plastic base holders where previously marked. If you don't have a rotary tool and a press you can use a regular drill. Just set it to its lowest setting. Failing that you can find something sharp and round like a precision screw driver to poke a hole. Use a drill bit that has a sharp end so it doesn't catch on the plastic and try to spin it. Something slightly smaller than a 1/8" bit is good for these syringe plungers. It wasn't shown in the video but between drilling the holes and mounting the plungers I cut out the opening on the bottom base. Use a metal straight edge and a sharp knife. It will take multiple cuts to break through. Work on top of cardboard or a stack on newspapers to avoid scratching your table or floor. Now that the holes are done its time to put the base on stilts. Take your syringe plungers and cut off the push tabs with a knife. Fit the rubber plunger through the bottom base (plastic card). You might have to slip it in a slant then rotate it to get it all the way in. Repeat to get all three stilts on. Then slip the top base (pringles lid) on top. Don't worry if stilts appear slightly skewed. It will still work. Mount the assembled mount on top of the F-mount then screw on ring #2. Measure about 50-60mm from the front of the F-mount and the end of the plungers. Cut off with scissors or cutter from pliers. The mount won't look as wonky after this. Get ready to glue on the Ee-A focus screen. Before doing that, make sure to clean your fingers with isopropyl alcohol. Also identify which side is matte. You can hold it against the light and tilt it slightly to compare. One side will be more reflective. The Ee-A has a big tab. If this tab is upper left or lower right you have the matte side up. I like to have the tab located lower right. It doesn't matter which way you have it. Adjust the base so its about 45mm from the flange (front edge) of the F-mount. When the focus screen is set it will be near the right distance for infinity. It won't be perfect yet but it will be close enough for now. Rest the focus screen matte side up on the top base. Carefully align the edges and hope it doesn't fall off. If you cut off too much material for the window you might have to hold it while you glue the edges. Time to plug in the hot glue gun. The glue gun needs about 3-5 minutes to heat up. When you glue, pull away from the focus screen. This ensures the left over glue threads don't land on the screen. The glue gun leaves strands of glue as you pull away, use your fingers to cut them. Let it cool for about 5 minutes. Now it is safe to handle. You can screw the #3 and #1 macro tube rings on. See how much clearance the top mount has to the wall. It's okay if they touch on some points. It just makes it noisy. You can cut at the touch points to increase clearance. At this point you have a static 35mm adapter! The rubber on the plungers allows the top base to vibrate freely while limiting the vibration transmitted to the adapter body. Yes, the top base making contact with the inner wall of the macro tube will introduce some vibration. Shaving the contact points will reduce that. Syringe plungers were used because these are relatively easy to get. Any strong yet flexible material can be used as long as you can attach it to the Nikon F-mount. Setting the focal plane to correct distance prior to making it a vibrating unit. This is the third in the series of instructions on how to build the YSM35B Vibrating 35mm DOF Adapter. In the last part we went through the theory of the vibrating mount. In this part we build it. The upper base of the mount is made from a thin sheet of plastic. It should be as light as possible so the stilts don't droop too much. In this case we use the lid from a Pringles can. Use a fine point marker to draw the inner ring from the #2 ring. You want this to be narrower than the inner diameter of the tube. This will allow it to move without hitting the wall of the tube. It can be rough and still work. Use a pair of scissors to cut it out. Try dropping it within the tube. If it falls through then it is good enough. 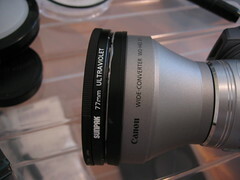 The bottom part will fit between the F-mount ring and the 2nd ring. Trace the inner diameter of the #2 tube for this. Getting it exactly is best. The #2 ring has a gap between the inner wall and the thread wall that attaches to the next ring. This is where this mount will be held fast. Again use the marker to draw the circle. Since its a card there the top and bottom may be cut off. That's fine. Cut with your scissors. With both bases cut, stack them on top of each other to get the relative center. We need to mark the window for the Canon Ee-A focus screen. Use some isopropyl alcohol to clean your fingers before handling. You want the matte side up. You can tell by comparing both sides against the light. Another clue is the big tab on the focus screen is on the right when matte side up. You can mark the edges with a fine point sharpie or with the box cutter. Set aside the focus screen and bottom base. Take a box cutter/knife and straight edge. Apply firm pressure on the top base and make a box window. It works best to apply lots of downward pressure to make the cut. The window should be very slightly smaller than the focus screen to make mounting easier later. Once the window is cut, put it over the bottom base and trace the inner window onto the bottom base. Also mark out where the three stilts should be. Leave about 2mm from the sides of the window. Then about four for the top. The bottom won't have a stilt but have a motor instead. This is just a fit test. Don't glue anything together yet! Use masking tape to fix the two pieces together. Please don't use cellophane tape or electrical tape as a substitute. The adhesives on those tend to leave a residue. We'll start drilling and gluing to make our initial static mount. This is the second in the series of instructions on how to build the YSM35B Vibrating 35mm DOF Adapter. You should have modified your Asian Macro Tube to have a 58mm thread by now. Before we begin lets get some background out of the way. 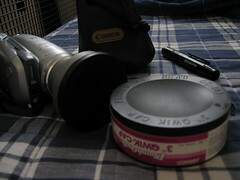 A 35mm adapter needs a condenser and ground glass. In our case the Canon Ee-A focus screen is both in a small package. This tiny piece of plastic has a matte side and a more transparent side. The matte side is what we will use as the ground glass. This side faces to the back of the adapter. The other side is a fresnel pattern that faces to the front. It serves as a condenser, not a great one but better than nothing, to capture the light from the 35mm lens to brighten it up on the ground glass. 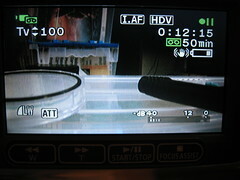 Normally, the ground glass needs to be held 46.5mm away from the F-mount on the adapter. But the fresnel piece changes the optics a bit so it should be closer by a few millimeters. We'll adjust this by eye later. If you have access to a collimator then good for you. If you could build one then I applaud you! Assuming the distance of the focus screen is right, the 35mm lens set on infinity should have a sharp picture for far away objects. This would mean the focus marks on the lens would be fairly accurate as well. With the above parts this is a static adapter. For daylight this is usually fine with fast lenses. The more you stop down on the lens the grain on the focus screen becomes more visible. There are ways to blur this out in software or you could eliminate this with hardware. 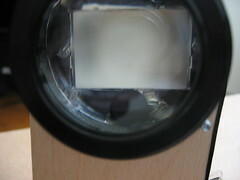 To remove the grain you could oscillate or rotate the ground glass. In our case we will use a small vibrating motor to oscillate it. We'll start cutting our initial static mount in the next post. This is the first in the series of instructions on how to build the YSM35B Vibrating 35mm DOF Adapter based on the parts lists of the YSM35(A). The build will be nearly the same except I'll be using a 58mm Opteka HD^2 Macro plus a smaller power pack. At the end of this series you will know how you could build one yourself. Or know enough about how one is built to diagnose problems with your existing adapter. 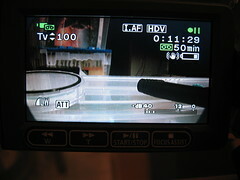 Use a non-slip pad to remove the glass from the UV filter. We only want the ring to convert the 57mm tube to 58mm. Use the two screwdrivers or compass (the drawing tool not the magnetic direction finder) to twist the inner ring counterclockwise. Applying downward pressure helps. This will unfasten the ring. Once you have it out remove this retaining ring and the glass. Take the Asian Macro and find the "1" ring. Set the rest side. You can discard the ring with the bayonet mount. Clean both the filter thread and the "1" ring with isopropyl alcohol. Set aside. Mix the two part epoxy on a piece of carton or paper with a paper clip. JB Weld is good. There is a white and black tube. The black one is harder to get the contents out. You will get a grey goop. Apply the goop to the rear thread of the "1" ring. Make sure to have some all around. Then stack the 58mm filter on top of this. The epoxy may get squeezed out on the sides and the inside between the threads. Press and hold for a few seconds. While the goop is still soft use the plastic card to scrape the excess from the outside. Inspect the front inner thread of the "1" ring and the rear outer thread of the 58mm filter. Clean out any goop on it. Allow this to cure for 24 hours. It will cure faster in warm weather. 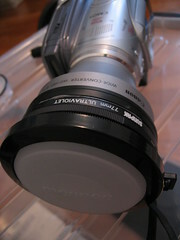 The Asian Macro tube is the body for the adapter. The ones off Ebay were 1mm too small. We need a standard 58mm thread to attach a macro, circular filter, and 43mm to 58mm step up ring later. The next post will be about how to build the vibrating mount. Guide to using and setting the YSM35 Vibrating Adapter. Just for reference. I discuss how to adjust manual focus with the HV20 and other general usage notes for a 35mm adapter. This video was made for my brother who is now the user of my first successful vibrating adapter. Note that the Bower 58mm Singlet has been replaced with a 52mm Opteka HD^2 +10 Macro. After almost a year I get back to completing my vibrating adapter. This time I switched the ground glass from the Nikon F3 Type D to a Canon Ee-A focus screen. I made a holder out of three syringe plungers, a key card, and the lid from a can of pringles chips. I kid you not, it's that ghetto. But it works. The pancake motor and motor controls are reused from the previous attempt. The assembly seems to work well. I'll have to explain the build and post sample footage in a later post. It's going to be a long story. And be careful when trying to source those syringe plungers. Apparently some states won't let you buy them without a prescription. I tried getting it over the counter once and I was given odd looks. I forget that insulin syringes might also be used for other drug applications thus these could be regulated where you live. There are alternatives such as nylon screws or carbon fiber wires. Bottle caps for stabilizers? Yeah, it might look silly but it could be convenient. Pick a common threaded bottle cap. Poke a screw through it. Put some washers and a nut in to expose just a small bit of thread. Fill the bottle with fluid or sand and you've got yourself a pendulum to stabilize your lightweight camera. It also makes for a very low on the ground tripod. Find a bottle cap you want to use. Mark the center. Use the smaller 1/8" drill bit to make a pilot hole. I use a big cardboard box so I don't worry about making holes on my workbench. Then expand the hole with the 1/4" drill bit. Clean out the center. Take the 3/4" 1/4-20 screw then thread the nut through to the base. Take one of the 1/2L washers (O.D. 25/32") and thread the screw into it. The inner diameter of the washer is smaller than the screw. So you may have to set it down a table and screw down with the screw driver. Then it's a matter of hold the washer as you screw it flush against the nut. Take the screw-nut-washer piece and thread that though the bottom of the bottle cap. Once completely through, thread it into the second washer. Both washers should hold the cap tight. This way you can thread the entire thing. You might want to use a third washer or some other spacer depending on how shallow the mount screw is on your camera. Fill the bottle with some sort or fluid or sand. Anything that will give it weight and keeps the bottle pointing to the ground would do. Then you've got a cheap stabilizer. If the bottle cap is common enough (like from bottled water or soda) you don't have to bring the body with you. Just buy your drink wherever you are and thread your camera in. You might get some looks but who cares if it makes your camera more stable.